Leurs Altesses Royales le Grand-Duc HÃ©ritier, la Grande-Duchesse, le Grand-Duc Jean, le Grand-Duc et la Grande-Duchesse HÃ©ritiÃ¨re. Son Altesse Royale le Prince Guillaume de Luxembourg, Son Altesse SÃ©rÃ©nissime la Princesse Margaretha de Liechtenstein, Son Altesse ImpÃ©riale et Royale lâ€™Archiduchesse Marie-Astrid dâ€™Autriche et Son Altesse Royale le Prince Jean de Luxembourg. 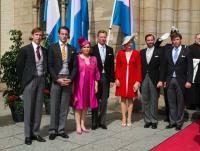 Members of the Grand Ducal family attend the ceremonies at the National Day. Arrival at the Grand-Ducal Palace in Luxembourg. Religious wedding of Archduke Christoph of Austria to Adelaide Drape-Frisch in the Basilique Saint-Epvre of Nancy. Civil wedding of Archduke Christoph of Austria to Adelaide Drape-Frisch in the City Hall of Nancy. 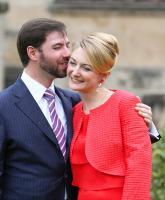 Official photo of Prince Felix of Luxemburg and his fiancŽ the german Claire Lademacher. 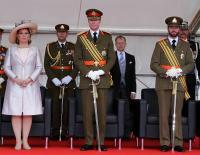 Grand Duke Henri,Grand Duchess Maria Teresa and Hereditary Grand Duke Guillaume at the Defile. The Luxemburg Grand Ducal family celebrate today the National Day with a Te Deum in the Cathredral of Luxemburg and the defile at the Ave. de Liberte. 1st day of the Statevisit from Ireland to Luxemburg. Arrival at the Palais Grand-Ducal, official photo, photo moment at the Plaquette Unesco at the Corniche, also they visited the Hotel de Ville Luxembourgh. Mrs. Tarja Halonen, President of Finland and her husband, Pentti Arajarvi to Grand-Duke Henri and Grand-Duchess Maria Teresa. 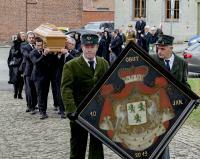 The Finnish president is on an official three-day visit to Luxembourg. STOCKHOLM 16-04-2008 Statevisit Luxembourg to Sweden. Arrival at the Nordic Museum of Grand Duke Henri and Grand Duchess Maria Teresa of Luxembourg and King Carl Gustav, Queen Silvia, Crown Princess Victoria, Princess Madelaine and Prince Carl Philip for the contrapresentation becaude the 3 day satevisit of Luxembourg. STOCKHOLM 15-04-2008 Statevisit Luxembourg to Sweden. King Carl Gustav and Queen Silvia officially welcomed Grand Duke Henri and Grand Duchess Maria Teresa of Luxembourg for a 3 day satevisit.